Grade 5 students got a preview of life as a middle schooler during Step-Up Day on Nov.19. That day, the eager fifth graders were given a tour of the middle school campus. While there, they were introduced to the faculty and staff, and learned about the various academic and extracurricular activities they will experience next year. The students also were treated to a special vocal performance by Dynamics, the grade 6 choir. Middle school mentors acted as hosts and hostesses to each grade 5 homeroom by leading the students on tours and answering questions about middle school. “Each year, the fifth graders revel in the new campus and expanded options, especially in the lunch line! This ‘taste’ of middle school sets the stage for the many decisions students will be making in the near future, such as elective and language options, and, most importantly, laptop platform for the one-to-one laptop program,” said Cindy Ellis, head of the middle school. Last month, in preparation for Step-Up Day, the grade 5 students were treated to a special visit by the middle school mentors, 6-8 graders who volunteer to help make the transition to middle school as smooth as possible. They also enjoyed a visit from middle school art instructor, Elizabeth Saltos, who spent the day with the students at lower school campus. 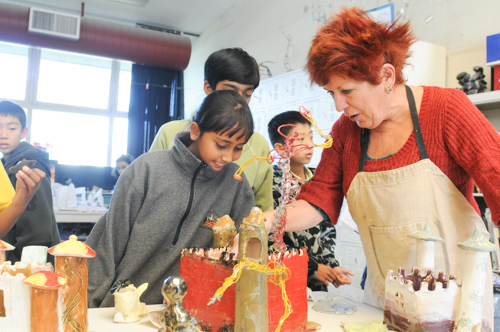 “While there, she engaged with the students, doing some projects and generally ‘advertising’ for art in the middle school,” explained Gerry-louise Robinson, Harker’s lower school art instructor.